Forgot to mention that the opening and only bid was $500. 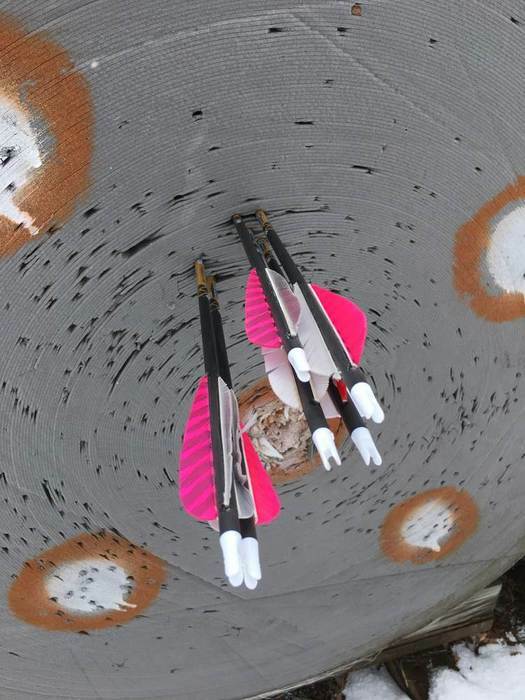 Here are the first six arrows shot at 20 yards. Still need to adjust the sights to point of impact. Bow has absolutely 0 hand shock and a very quiet “thunk” sound when shot. The sound of the arrow hitting the target is louder. My arrows weigh 375 grains. Can’t wait to set up the chrony and see how fast it really is shooting. Need to get the sights set so I can shoot 5 spot and my practice broadheads. The draw curve and very smooth with just a little stacking before the cams break over the hump. Back wall is solid without any squish. Letting up from full draw was a bit difficult the first couple times because I wasn’t sure where the launch point was but I can now easily let the bow up without jarring. No problem with the string angle and using my nose on the string as a reference point. Had to slide the peep up just a bit for alignment. Curiously, the peep doesn’t rotate at all during the draw cycle. Where I had it angled is where it stayed at full draw. It now points straight back from the string and stays completely open at full draw. As I shoot the bow “in” a bit I expect the peep will need to be realigned but as of now it hasn’t moved through about 15 shots. So far so good. As mentioned a couple times I was also really interested in the Mathews NO CAM as my last bow. Everything I saw and read looked like that bow would be a good choice for an aging archer with a gimpy right shoulder. Smooth, forgiving etc. What I have seen work for aging archers with bad shoulders is a bow with a very high brace height and set at 40-50 pounds. 40 pounds of draw weight with a cut on contact broadhead is plenty for a whitetail deer or a turkey. My wife shot 40# with a 24 1/2" draw and has passed the arrow through most deer she has shot. The boys started out at 40# also. It is all about taking short ethical shots. The type of bows C.J.L. posted up killed a lot of game and are still doing so. What grams are you shooting for field tips or broadheads? Draw weight? 70#, 29” + a loop, 100grain field and broadheads, 28.5” Goldtip Hunter 400 8.2 grains per inch. This post has my bow hunting synapses popping. I'm gonna crank my Outback down from my usual 60 pounds to 50-55 and try my shoulder out today or soon. I'd like to try for one of my spring gobblers with a bow.